George Petty created ‘The Petty Girl’ – she was an American pinup icon who captured the nation’s heart for more than twenty years. This guy is number 3 in my top Pin Up artists of the day, these were such an influence on me as a teenager back in the UK. From 1933 to 1956, her likeness was seen on tens of millions of calendars, magazine centrefolds, advertisements, posters, and billboards as well as on all sorts of speciality products. In 1950, “The Petty Girl” even became a major motion picture. Petty’s creation made her debut in the autumn of 1933, in a full-page cartoon accompanied by a snappy caption in Esquire magazine’s inaugural issue. 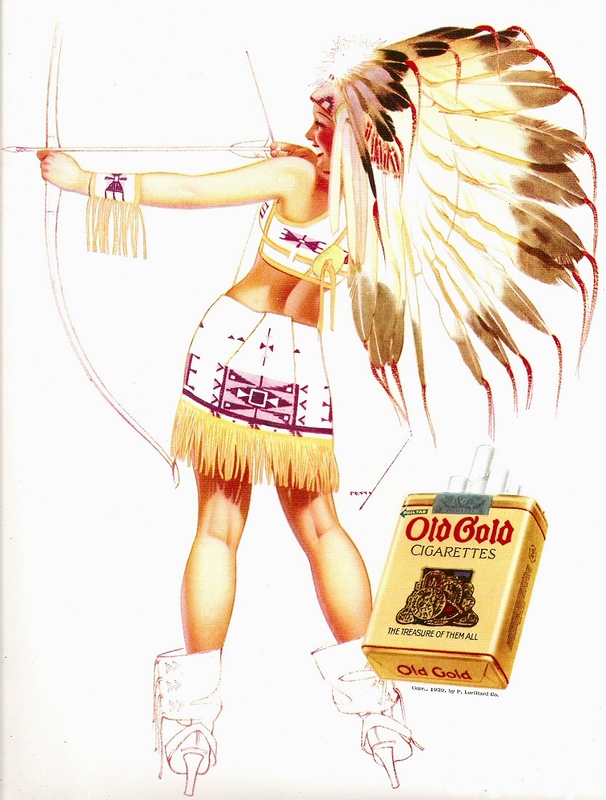 For the rest of the decade, she was featured in such popular venues as monthly advertisements for Jantzen Knitting Mills and Old Gold cigarettes, a print, postcard, and full-page national advertisement for Trans World Airlines (1936), Esquire’s deluxe hardcover Petty Folio (1937), and Life magazine’s article, “Petty Girl … Is Feminine Ideal American Men” (June 26, 1939). By 1940, Petty had become a national celebrity. His relationship with Esquire had worn thin, however, and when they secured the services of Alberto Vargas a year later, he left the magazine – but not before he had contributed a rich legacy to the history of pinup and pinup art. During the next ten years, the Petty Girl seemed to be everywhere. Along with the Varga Girl, she helped build morale during wartime. 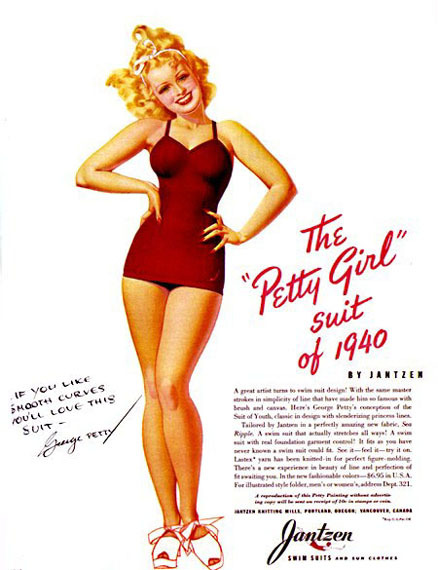 A 1940 advertisement for Jantzen, featuring a Petty Girl m swimsuit the artist had designed himself, ran for months in every major magazine. 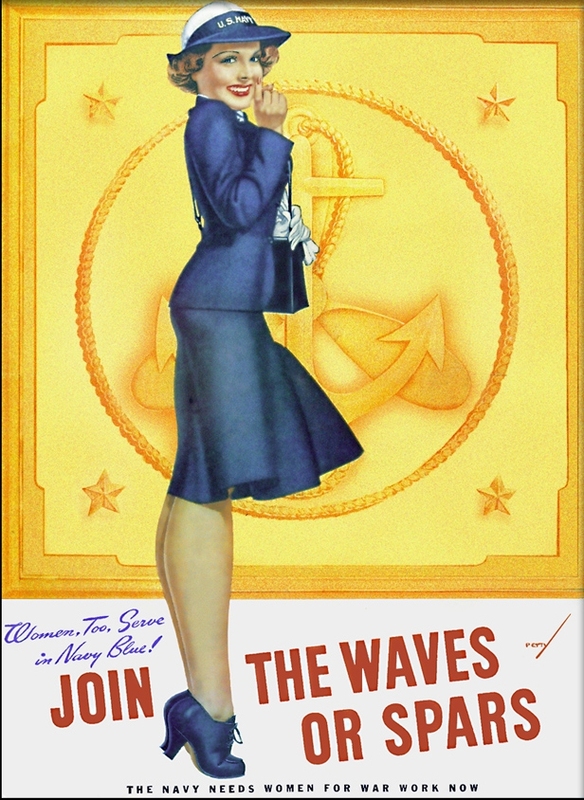 This image, Petty’s most popular to date, led to a great number of commissions for the artist, including pinup ads for Pepsi Cola and, on November 10, 1941, a Time magazine front cover of Rita Hayworth. In 1945, Petty entered into a special relationship with Fawcett Publications’ True magazine, where the Petty Girl began appearing every month as either a centrefold or full-page illustration. The magazine published best-selling Petty Girl calendars in 1947 and 1948 that contained some of the artist’s finest work. Among his commissions for the entertainment industry were four promotional pinups for MGM’s musical Ziegfeld Follies (1946). Petty returned to Esquire to create two calendars in 1955 and 1956, which garnered a whole new generation of admirers for him. 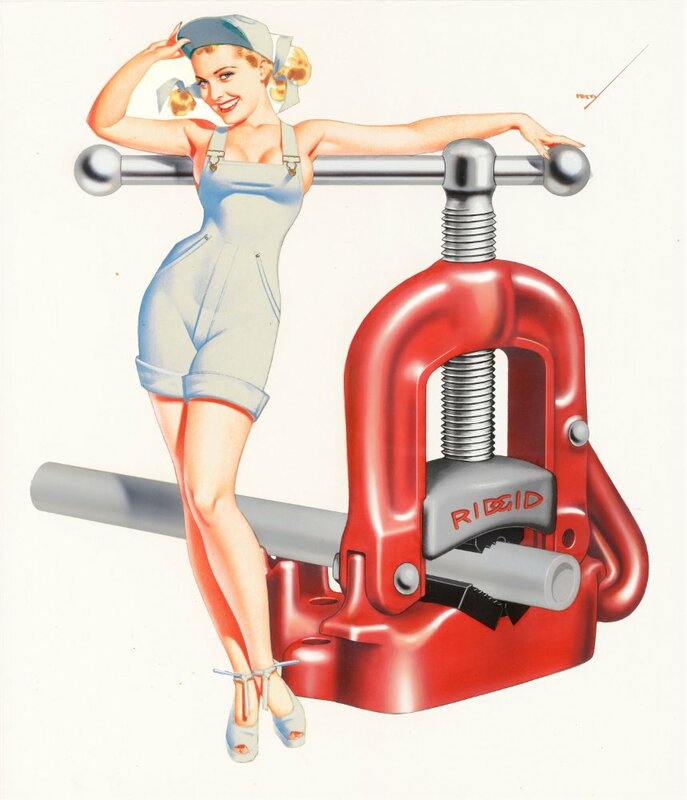 His other important calendar client, besides Esquire and True, was the Ridgid Tool Company. His innovative works for that firm were devised in a highly original way. Petty first painted an image on illustration board, then cut it out and pasted it onto a photostat of a tool, and finally painted over the background image. The creator of the fabulous Petty Girl was born in 1894 in Abbeville, Louisiana. After his family moved to Chicago, he worked in his father’s photography studio. Upon graduation from high school, he travelled to Paris to study at the Académie Julian under Jean-Paul Laurens. Back home, he worked for a printing company as a photo retoucher and became the head of the household upon his father’s death. Petty married married in 1918. His daughter, Marjorie, was born a year later, and his son, George, in 1922. By the mid 1920s, Petty was working full-time as a freelance illustrator, providing pretty girl images to a calendar company. After he opened his first studio in Chicago in 1926, his burgeoning client list came to include such companies as Marshall Field’s (catalogue front covers) and Atlas Beer (billboards, newspaper ads, and window display art). The first model for the Petty Girl was the artist’s wife, followed by his daughter when she became a teenager and even his son, who was enlisted to pose for the “Petty Man” in the Jantzen advertising campaign. Petty was a large man, often compared to Ernest Hemingway because of his rugged appearance. Like the famous author, he enjoyed big game hunting and often went on safaris to Africa. For more than ten years, he was an appreciative judge at the Miss America pageant in Atlantic City. In 1973, for Esquire’s fortieth anniversary, Petty created a modem-day version of his pinup girl with grey hair and granny glasses. He died on July 21, 1975, in San Pedro, California. The Petty Girl had a mischievous, engaging smile and a special twinkle in her eyes. Long-limbed and well endowed, she was a slick, supple, and alluring creature. 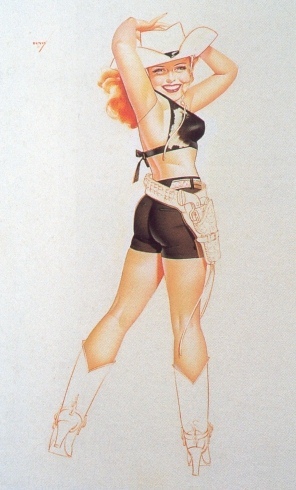 Like many pinup artists, Petty created these ideal American girls by combining the best features of several models. He further improved on nature by making their heads smaller and their legs and torsos longer. Whatever his secret Petty certainly had the magic touch. 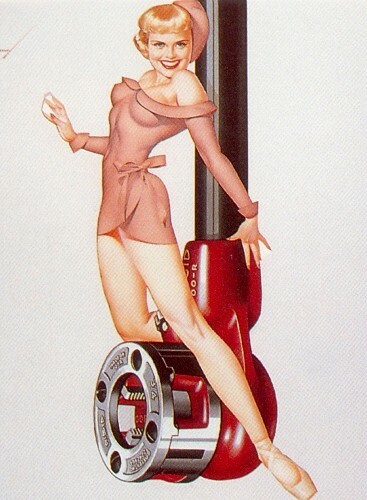 These art pieces are just something else and, how better to sell tools and industrial hardware, then grabbing the attention of the workers etc, with a pin up girl strewn across the particular part. This entry was posted in Blog and tagged art, cafe racer, hot rod, pin up, rocker, ton up.